Compact and ergonomic design for the most effective use of space with the smallest footprint. Features a unique handle mechanism to facilitate the movement of the upper table and equipment with extreme ease. 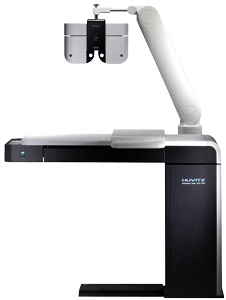 Power arm for manual or digital refractors offers 45 degree soft movement to accommodate any patent comfortably. Integrated keypad buttons offer easy control of power arm and chair to provide convenience for positioning of patient’s eyes.